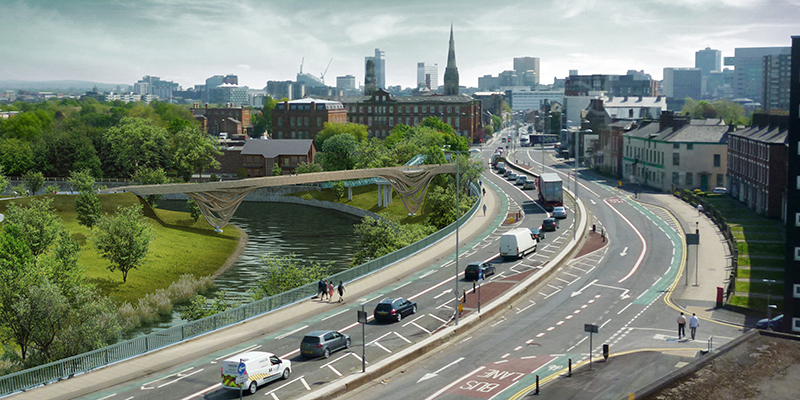 The bridge creates a meandering passage across the River Irwell, reflecting the natural course of the water flow and thereby providing changing prospects onto the Meadows and the urban context. The structure takes into account the different characteristics of the two banks. Its changing appearance negotiates between nature and urbanity and refers to wood as a composite material consisting of individual fibres. 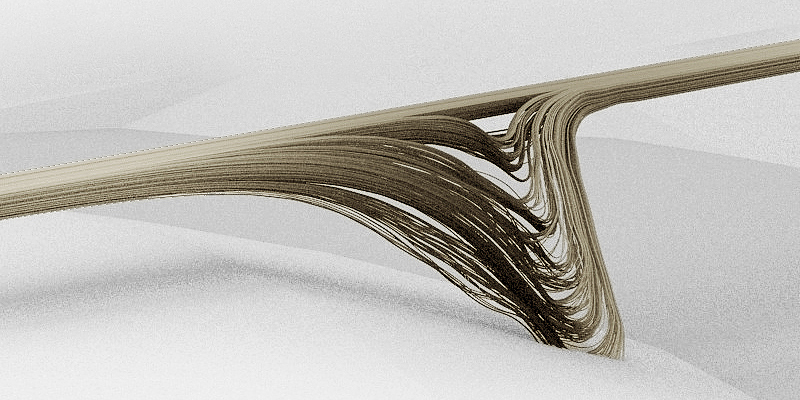 The main flow line of the bridge breaks up into multiple sub-currents, creating a surprising and complex structure out of simple elements. 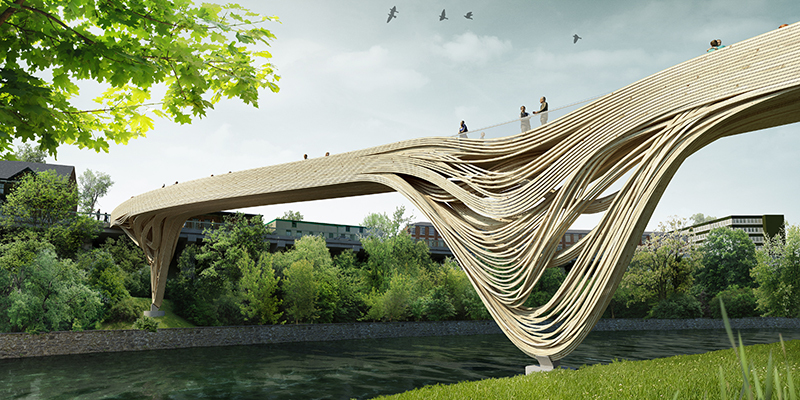 The bridge expands and exposes its individual members to generate the vertical supporting structures that touch the banks. 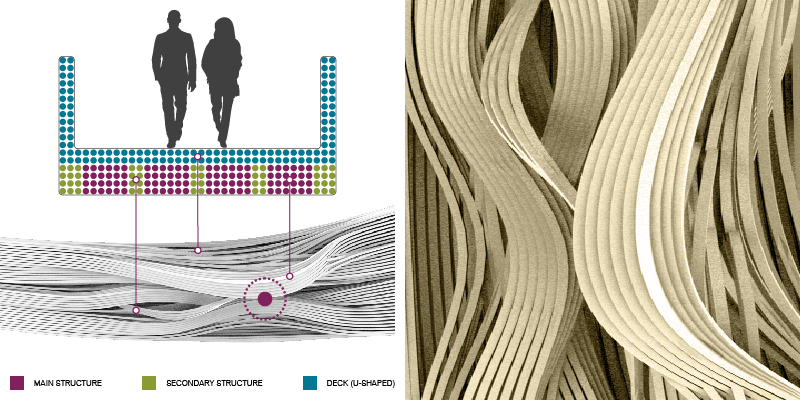 The fibrous bridge negotiates between two different kind of logics – the confined and complex, rigid body and fluent streamlines, traditional bridge structure and 21st century engineering. The bridge is constructed from approximately 300, 100mm x 100mm timber elements or “strands” that are laminated together to form a monolithic element that crosses the River Irwell. 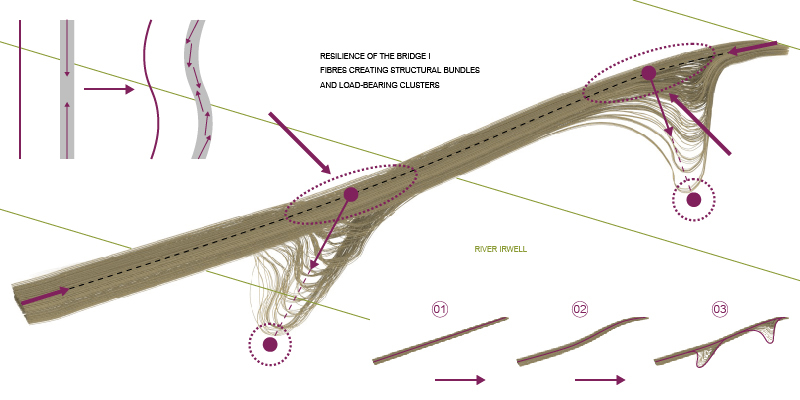 The individual timber strands that form the overall collective, bifurcate at two locations to form piers that create an efficient structural diagram. The primary structural elements consist of a U-shaped deck which utilises the increased depth provided by the timber balustrades; individual strands that are clustered together to form the primary load bearing elements and secondary elements that from the architectural composition. 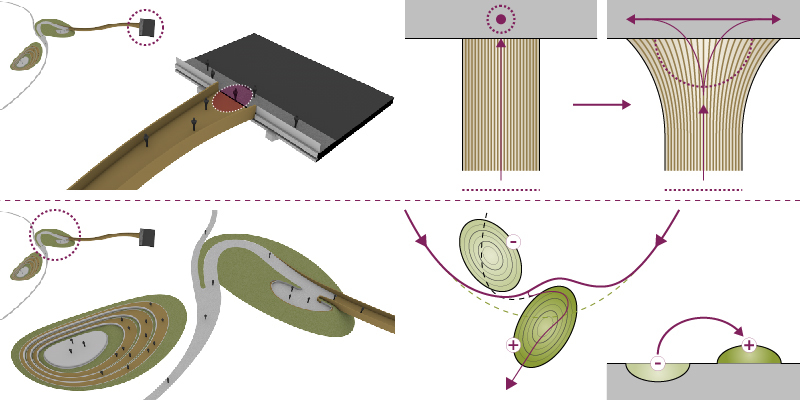 The bundles of strands are collated together using standard epoxy processes used in the formation of conventional glue laminated (Glulam) beams and bridges. The size, orientation and interconnection of the bundles varies according to the stress of the cross section and latticing geometry that braces the individual bundles that from the legs. 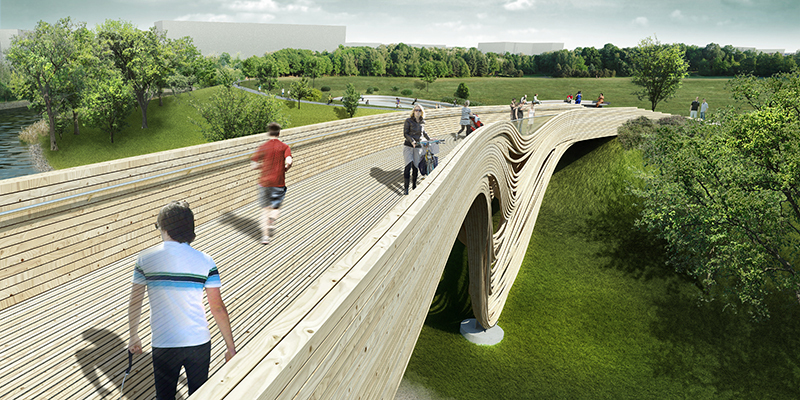 Timber has been chosen for the material form of the bridge as it is incredibly strong for its weight and hence historically it has been abundantly used in many pedestrian bridges.